Toyota provides little documentation and diagnostic help when it comes to their temporary 4WD systems. 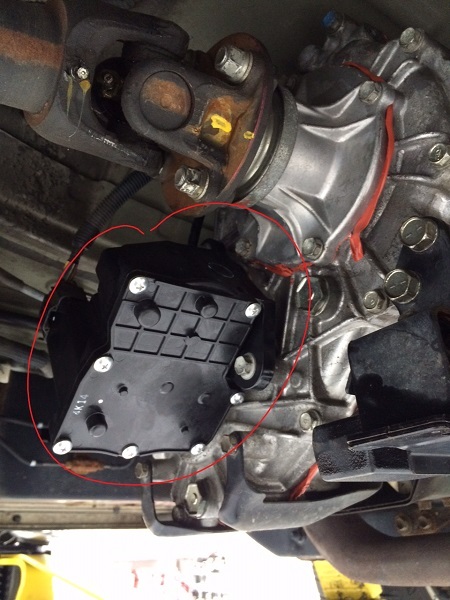 The 4WD module has no self-diagnostics and the repair manual is little help in the way of diagnosing transfer case actuator/front differential automatic disconnecting systems. The wiring diagrams for the systems also don’t indicate when the monitoring switches (which track the internal location of the actuators) should be open or closed. 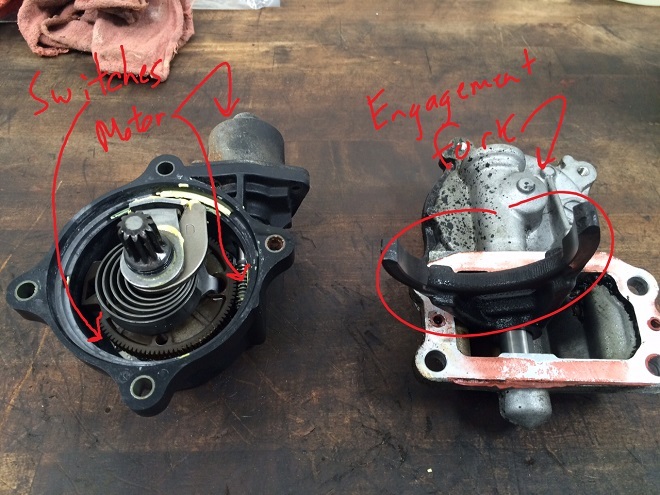 Getting a good diagnosis on a failed actuator, either at the transfer or the front differential, is difficult. The above is the transfer case open with the rear gear cluster installed. 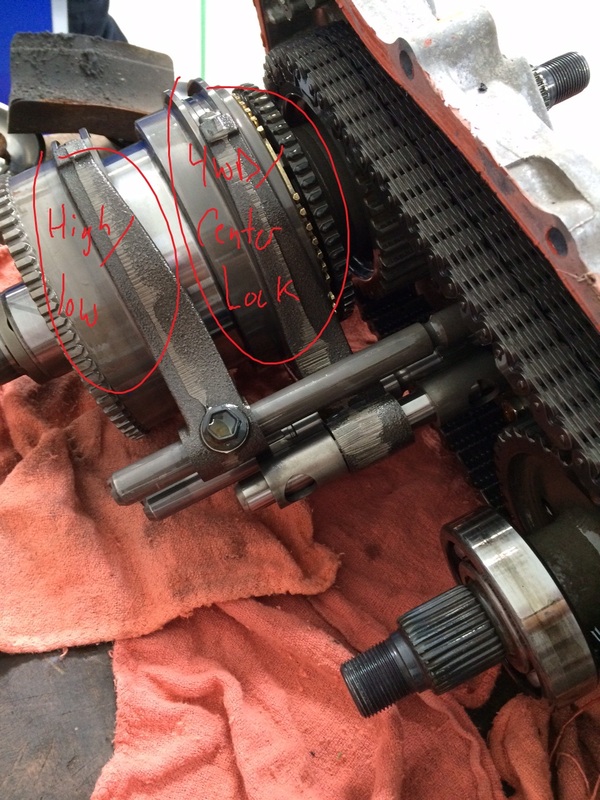 Highlighted is the high/low select gear as well as the dog teeth that engages the center differential lock. The above is pictured after the new actuator was installed in the 4WD high position (the actuator itself includes the rods that are attached to each select fork pictured). A sharp eyed technician will also note that the actuator shaft clips aren’t installed – they were after the photo was taken (there are three total on this transfer). TOYOTA SHIPS THE ACTUATORS IN 4WD HIGH POSITION. MOVING THE ACTUATOR SHIFT RODS MANUALLY ANY AMOUNT WILL MISTIME THE NEW ACTUATOR, NECESSITATING A SECOND NEW ACTUATOR. DO NOT MOVE THE ACTUATOR SHIFT RODS. It is OK to move the select forks and gears to get everything to line up, just don’t move the rods less you destroy the actuator and you’ll have to buy another one. 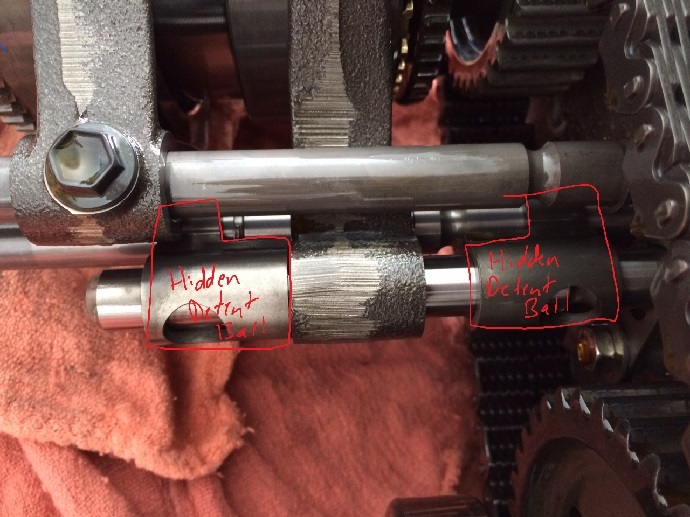 Noted are the hidden detent balls that engine the lockout shaft. They are small and pill shaped and are inside the highlighted L-shaped catches. After the new actuator was installed and the FIPG gasket was allowed to sit overnight, the transfer case was filled with gear lube and returned to service, now with functioning 4WD High/Low and center differential lock. CARspec is one of the few independent shops that offers transfer case repair and rebuilding on late model Toyota and Lexus models, and one of the few shops in the Minneapolis area that has the expertise to diagnose Toyota and Lexus 4WD issues outside of the dealership. As Minnesota’s independent Toyota, Lexus and Scion repair specialist we pride ourselves both our fast turnaround, expertise and quality that is unmatched in the industry. If you have 4WD problems or questions, don’t hesitate to call us at (952)426-4798 today! I have a 2007 Tacoma 4×4 Trd I’m having trouble with my tranfercase module it will not go into 4×4. Is there any other module I can buy I’ve bought 2 already an they don’t last. I’m confused which part you are replacing when you say “module”. Care to elaborate? 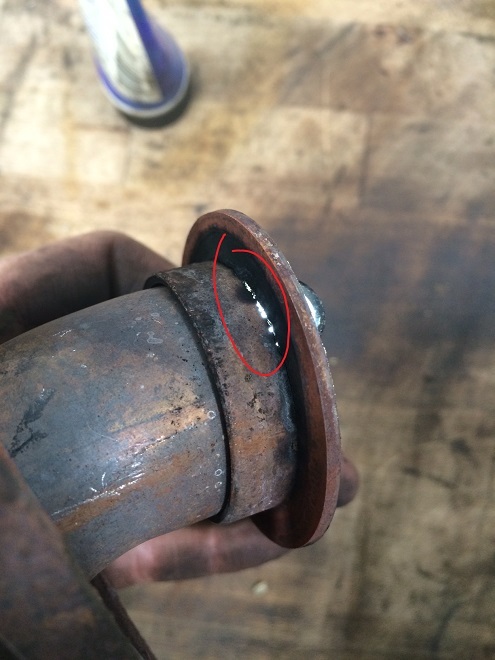 While it may be possible to reuse the old actuator shafts, I am not aware of any way to correctly time the shafts if they are removed. 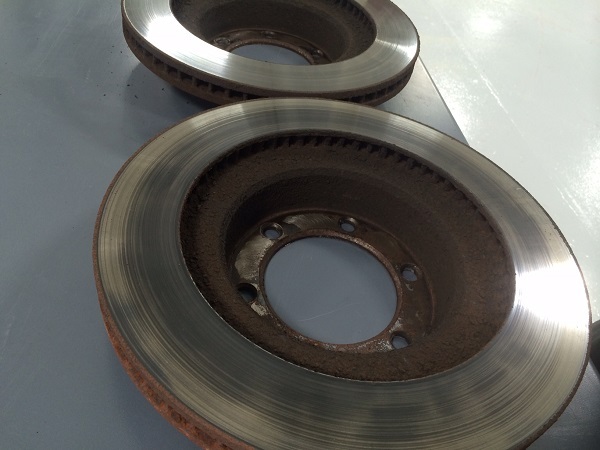 The total labor involved, including the new transfer actuators you would potentially damage during the process, make this kind of tinkering cost ineffective for a customer. I’d hate to have to buy multiple actuators trying this when we could have fixed it the first time with the rebuilding. In any case, a good question. we have a 2004 Toyota 4runner that will not come out of 4lo. I jacked up the front end and tapped on the actuator. Then I removed the actuator plastic covers and the motor is working. I placed the vehicle in neutral while on jacks then moved the selector switch back and forth and the front tires continue to turn. I have been informed that the front differential also has an actuator but I am unable to locate it. Do you believe this could be the culprit.